This building has been placed on the National Register of Historic Places by the United States Department of the Interior. 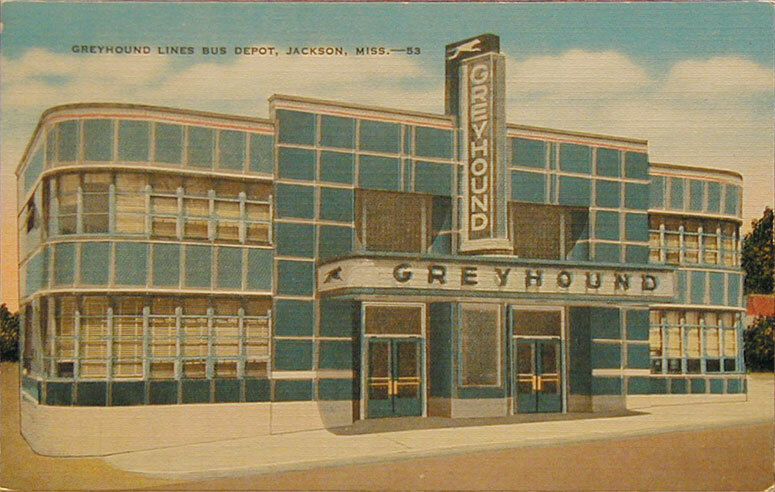 The Greyhound Bus Terminal—Constructed circa 1937 and restored in 1988 by Robert Parker Adams, Restoration Architect, the station has an undeniable place in Jackson's, and the south's, history. 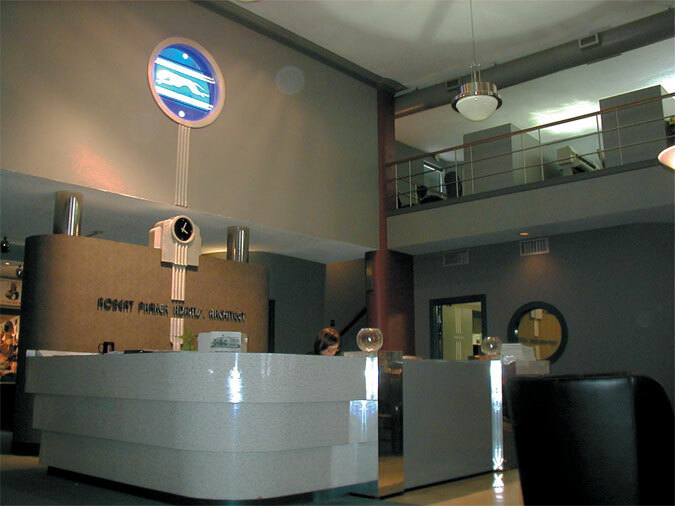 The present-day lobby was the waiting room. On the second floor, on either side, were observation decks, and the bathrooms, with shower facilities for the men and a bath tub for the women. 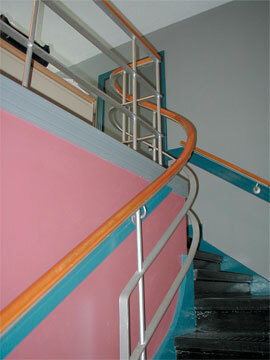 The stairs (below, left) led to the women's area. 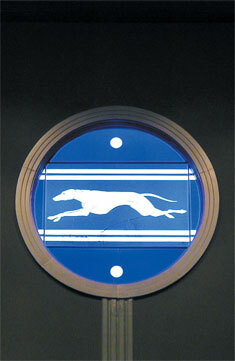 The round window with the Greyhound logo (above, center) was discovered during restoration, sealed up and covered over as it leaked rainwater. 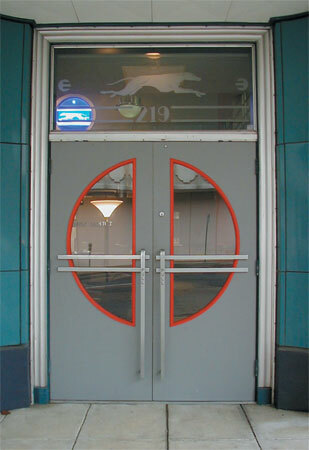 The double doors (above, right) connected the station's coffee shop with the kitchen area. This coffee shop, with its distinctive horseshoe-shaped bar, was known as the Halfway House Restaurant and was one of three locations in Jackson where the Freedom Riders of the 1960s challenged integration laws. 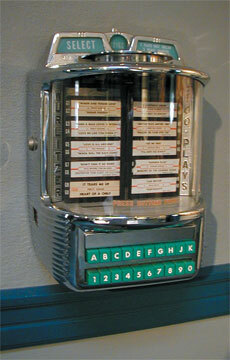 The pinball machine (left) and Wurlitzer jukebox selector (right) are original items from the era. 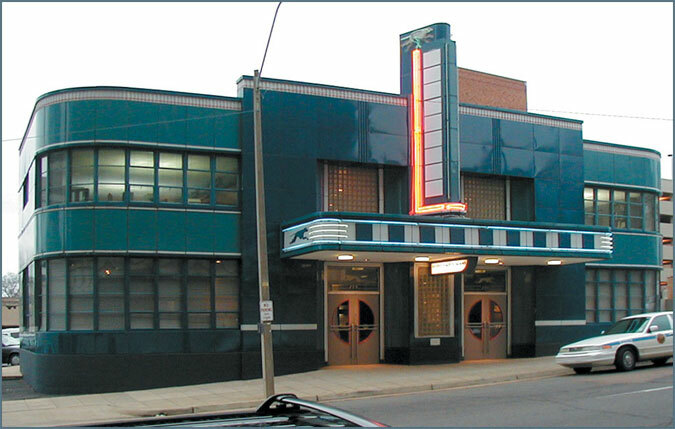 Fondly remembered as "The Dog," the station was a favored haunt of students from nearby Central High School, where they would enjoy a six-ounce Coke and a few rounds of "The Eye of the Tiger." 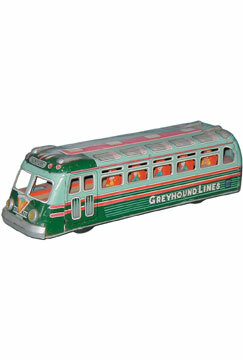 The toy Greyhound bus in the center is one of many scattered around the office. 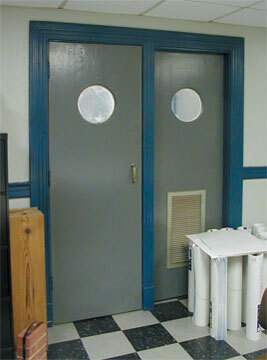 Both sets of front doors (left) are recreations of the doors that once graced the building. 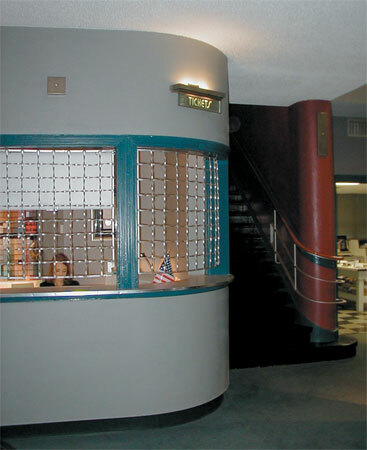 The ticket booth (right), complete with cage and lighted sign, now serves as the interior design department of the firm. 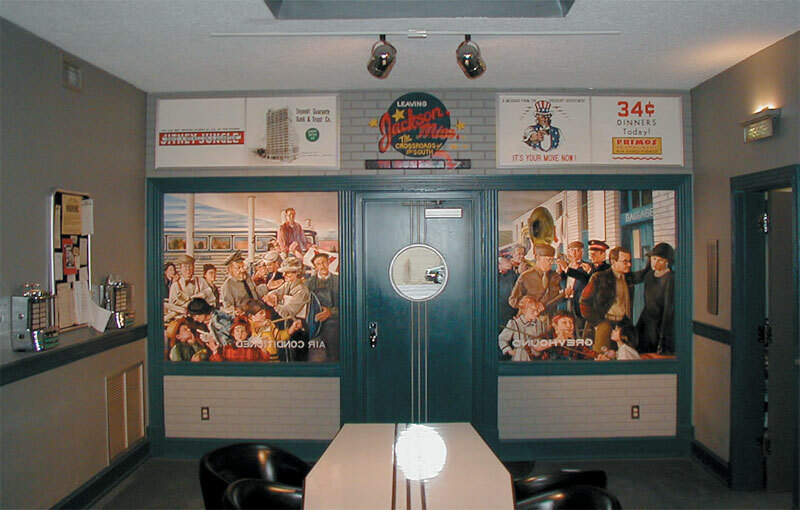 Painted to show how the station's embarkation area may have looked during the time of the Second World War, this mural has many faces familiar to those associated with the building's restoration. For example, the bus driver and the station manager engaged in a heated conversation in the left window are owner Robert Parker Adams and Mary his wife. A 1953 postcard of the Greyhound Bus Station as viewed from across Lamar Street. 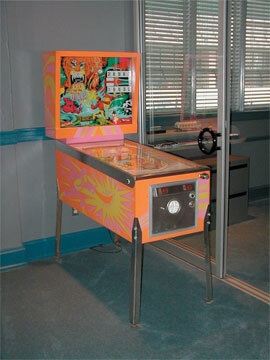 Compare this scene with the current photo at the top of this page. Postcard courtesy of Forest Cooper.